Telegraph Offices in the south-west region. then to Cygnet on 6 May 1915. The latter change had "serious opposition from the Postal Department". Has circles centered on letters for separation. Has centered dots for separation. 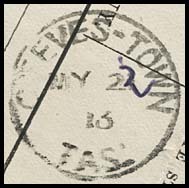 Ellendale date stamp on telegram piece (probably from AW-TO-9Ba). The Telegraph Office was opened in 1872. 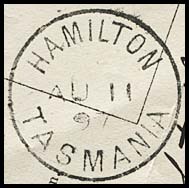 The earliest recorded telegram to Hamilton is 20 July 1875 from Bothwell. No separation marks between top and lower words. 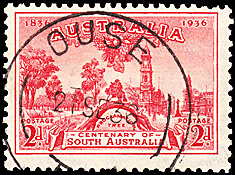 The Post Office had opened by 1865.
a Type 2 date stampwith the date in one line, mnth in three leters and the year in two digits (ERD 18 September 1908). 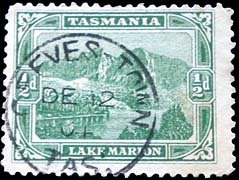 Type 1: 2 line date, TASMANIA at the base. 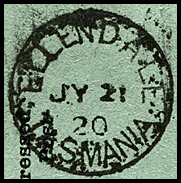 Australian period - one line date, TAS at the base. 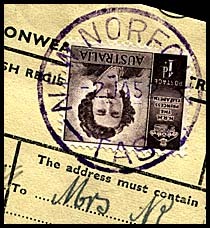 Addressed to the Telegraph Office, New Norfolk. Colonial period envelope (TC-EA-1) with TELEGRAPH DEPARTMENT in lower left corner. From previous stock used after the amalgamation of the Post and Telegraph Departments. The Telegraph Office was opened in 1876. In the 1890s, Ouse became an important branch for a southern route to the west coast. The Telegraph Office was opened in 1879. It was the most southern office on the main line in Tasmania - and therefore in Australia. Sir, Will you kindly allow me to ask whether the public house at which the murderer Stockley and wife, with their friends, were drinking and fighting - and from which they were turned out, according to the evidence of the landlord's son, at twenty minutes after 10 o'clock on the night of the murder, very drunk - is the house at which the telegraph office has been and is now open? If so, there is no reason to wonder at the respectable portion of the residents of Southport refusing to use the office while there. The proceedings in that house, as given by the various witnesses in the above-mentioned case, were disgraceful in the extreme; and if the Government have located the telegraph office there, the sooner they remove it the better for their own credit, as well as for the convenience and comfort of the people needing to use it. 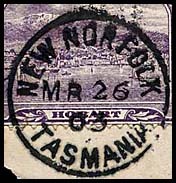 Hobart Town July 24, 1870. Sir, The remarks under the above heading of your correspondent " Enquirer," July 23, are calculated to mislead the public, both as to the general character of the house referred to, the Southport Inn, and as to what took place in that establishment on the night of the recent murder. For the last 16 years I have visited Southport at intervals of from six to 12 months, making a stay of from one to four or five weeks. I have on the visits usually made this hotel my residence - if not during the week, on Saturday nights and Sundays. I have therefore had very good opportunity of judging of the manner in which it has been conducted, and have no hesitation in stating it to be one of the quietest and most orderly in its "bar" business of any I have ever visited, and that case of drunkenness, fights or bad language, observed by me, have been decidedly rather the exception than the rule. It happened that I was staying at the Hotel on the Saturday night of the murder. I was also foreman of the jury at the inquest, and could see nothing, either from personal observation or from evidence to justify the severe remarks of "Enquirer." The evidence of the woman Morrison as to loud cries of distress during the early part of the night, certainly amazed me, and the fact that such cries were unheard by either Mr. Hoskins or myself, sitting in a room, in a perfectly quiet house, within 100 yards of the spot whence they were said to proceed, convinced me she was untruthful, and suggested questions by the jury to herself and other witnesses, replies to which proved her evidence to be unreliable, both here and at the trial in Hobart Town. The fact that cries heard at a later hour caused no alarm may be easily accounted for by explaining that the house is within a short distance of the sea beach, on which the waters of the bay keep up a perpetual roll and surf. Persons sleeping under such circumstances are not likely to be disturbed by cries heard very distinctly at a greater distance by a "night watcher" during the intervals of the beach roll; they were certainly not heard at all by myself and but once by Mr. Hoskins. The evidence tended to show that the man Stockley, although slightly intoxicated, was quite capable of taking care of himself and his unfortunate wife, and as he expressed his intention of taking her home. I hardly see that her detention at the inn would have been justifiable. It appears to me that the only offence committed by the landlord was the "supplying the drink" and as he is licensed by law, and pays for the right to do so, it can hardly amount to a crime. I should not have troubled you on the matter of the "Southport Telegraph Office" had the controversy been - as hitherto - confined to the question of broad principle; but your correspondent having made, it appear that the objections of the people at Southport (or of the portion who do object) are based upon personal grounds, and owing to the house being kept in a disorderly manner, a sense of justice, knowing the contrary to be the truth, induces me to come forward and contradict this view of the case. Telegraph lines in the South-west region. 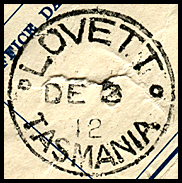 Listing of Telegraph Offices in Tasmania.